Operation Finale is horrifyingly intense as well as funny at times. The two main characters, Peter Malkin (Oscar Isaac) and Adolf Eichmann (Ben Kingsley) are terrifyingly realistic. The suspense feels like it's on real stakes because this film is based on actual events. One criticism I have is that all the secondary characters are easily forgettable. The story of this film focuses on a group of Israeli agents who are tasked with capturing and bringing back Adolf Eichmann, a Nazi Lieutenant who escaped justice after World War II to Israel. The agents spot him at his house after a spy tells them where he lives. They watch his daily routine until they memorize it and fake their car being broken in, to jump him. They take him back to where they are staying and take turns watching him. One day, the airport calls saying that they have to get a signature from Adolf Eichmann to let them board so they try to convince him to sign. Malkin tries a more friendly approach to make him sign and they get to know each other. My favorite part in this film is when Malkin and Eichmann are getting to know each other. You get to see Eichmann's side and how he interprets the holocaust. That is very interesting. There are two big names in this film. Ben Kingsley plays Adolf Eichmann and Oscar Isaac plays Peter Malkin. Ben Kingsley has been in numerous award winning films such as Ghandi, which he won an Oscar for best actor. Oscar Isaac has been in Ex Machina, an Oscar winning film and the Star Wars series. I recommend this film to anyone who wants to know more about the Holocaust or World War II. You should be aware that the adults in this film smoke and drink. 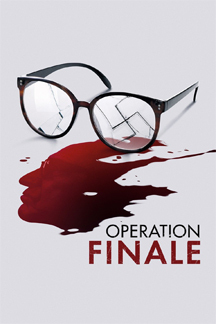 I recommend Operation Finale for ages 13 to 18, as well as adults. I give it 4 out of 5 stars. This film opens in theaters August 29, 2018 so look for it.